Open-source eCommerce shopping carts are useful for both small as well as large scale businesses which are operated online. These serve an important role to boost up productivity and brand reputation with a minimum effort and lower cost level. Listed below are the top 3 Open-source Ecommerce business applications that comes with availability of various modules/extensions to enhance the functionality of your eCommerce store in a much better way. Launched in the year 2008 as an open-source e-com web application, Magento is now featured with about 4 billion downloads. Magento, due to success in e-commerce solutions, was taken over by eBay in 2011. It uses Object Oriented Programming (OOP) as the most efficient way of programming. This, in turn makes Magento solution much faster and an efficient Ecommerce solution amongst business owners. Magento’s unmatched services like flexible designs, premium web hosting, powerful marketing tools and 24/7 support makes it a preferred choice amongst small as well as large business owners. Customizable design- Customers have a choice to customize the look and feel of their e-Commerce site to their existing store theme or logo. With a user friendly page design, they will be able to have a look exactly the way they want. Unlimited product options- Customers can now be able to add as much as product quantity as per their choice, based on category and itemized on color. SEO centered approach- SEO designed Magento websites offers visibility in terms of page ranking in Google’s results. Add-on features- Magento is featured with many useful extensions that helps in adding other functional features to their website. The use of add-ons promote designing a website that shines look wise as well as functionally. Customer engagement- Providing more information on products increases chances of greater sales by same customer. Product comparisons also helps customer to decide on which product is better for them. Secured Payment Services- Secured payment is another important requirement for eCommerce websites to gain customer loyalty. Magento websites have fully secured payment gateways with variety of options in payment. Prestashop is again an Open-source ecommerce shopping cart software solution that is speedy, lightweight and easy to install. Prestashop has appeared to be innovative and excellent solutions for all type of enterprises. There are certain technical requirements for Prestashop, like Apache web server 1.3, PHP 5, MySQL 5, Linux or Unix. Prestashop users can make benefit from this application as it is reliable and flexible. Customization- Prestashop store can be easily customized depending on the needs of customer. Clean and well defined coding structure- This allows for additional code to be entered for modifying the look and feel of website, making it more functional. Quick and easy to install- Being light weight in design, Prestashop allows faster installation. OpenCart is based on PHP and MySQL based database management system which is best for designing great eCommerce websites. OpenCart gives full control over template management. 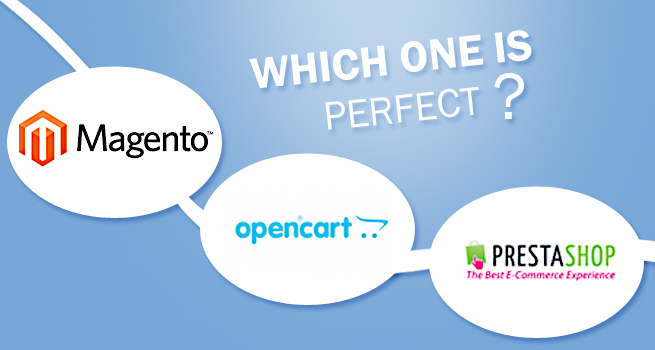 In comparison with Magento and Prestashop, OpenCart takes less time to finish the integration of template to your eCommerce store. It is again quite easy to install. In a nutshell, the above mentioned Open-source eCommerce software application provides a new direction to eCommerce business in a positive way. By implementing these software application, you will be able to design a website that not only sells but speaks also for your brand globally. Customers will turn down more towards your service, if they will get better browsing and customer service experience on your eCommerce store. So, what are you waiting for now? Try these eCommerce software applications to accelerate your online productivity with long time customers.